Some travelers consider Miami to be one of the most exotic places in the United States, making it a perfect place for a bachelorette party. From the beautiful beaches to the exciting nightlife, there’s so much to experience with your favorite people by your side. 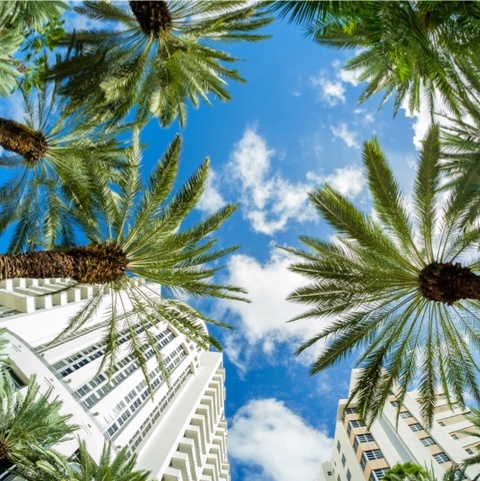 Miami is one of the largest and most populous cities in the South, making it a major hub for travel and vacations. The endless nightlife options make it a perfect place for taking friends for a fun weekend! Regardless of distance or late nights, Falcon Charter Bus is here to provide smooth and streamlined transportation options for your group. Falcon Charter Bus is a leader in professional and efficient group transportation services. We’ve handled charter bus and minibus transportation for groups of every size across multiple locations throughout the Southeast. The 18-passenger minibuses we charter are popular options for bachelorette parties, while larger 56-passenger charter buses work best for shuttling wedding guests. Each modern bus comes with the options of comfortable amenities like WiFi, cushioned reclining seats, and extended legroom. With services throughout Charlotte, Orlando, Atlanta and beyond, we have travel accommodations available for groups traveling long and short distances. Chartering a bus will give your group the freedom to travel through Miami without the hassle of organizing through rideshare apps or traveling in multiple vehicles. Don’t worry about having a designated driver-- each charter bus includes a professional driver to keep your group safe on Miami roads. Enjoy fun and stress-free nights on your charter bus with a sample itinerary of a few highly-recommended Miami hotspots. As a whole, Miami is a relatively expensive vacation spot, especially for groups. What better time to splurge a little than on a special weekend? Luxury hotels near downtown and the beach put you in the heart of the bustling nightlife and include amenities you won’t find at cheaper hotels. Whether your group is traveling from out of town or you’re Miami locals and want to experience a staycation weekend, these hotels are excellent options for a glamorous celebration. As one of the newest boutique hotels in Miami, Hotel Beaux offers an ultra-modern atmosphere with luxury amenities for a comfortable stay. The hotel is located in the heart of downtown off of the Miami River and is just a hop away from Miami Beach. With both Brickell and South Beach locations in Miami, the SLS is known for having prime locations for a great value (by Miami price standards). The South Beach location includes oceanfront views and award-winning restaurants. The boutique hotel is located in the heart of South Beach on the famous Ocean Drive stretch. The Betsy offers a more contemporary twist on Miami’s art deco scene and is a dedicated space to honoring arts and culture. Miami’s public transportation isn’t the most reliable and rideshare apps can be expensive if you’re traveling with a large group. A charter bus or minibus can take your entire group from point A to point B throughout the city, without the worry of everyone making it to each location on time. Your group can stay together and ride in comfort, while your driver takes care of the hard part. This includes rides to and from the airport, hotels, restaurants, bars, and other activities. There are countless group-friendly activities to experience in Miami. Loosely planning each day will keep the good times rolling on a reasonable schedule. Start the morning with a delicious breakfast at Front Porch Cafe. The local eatery is famous for their all-day breakfast and is walking distance from many hotels on the beach. You always have the option of taking your charter bus to brunch if the walk is too far or your group isn’t quite on board for soaking up the sun quite yet. After enjoying breakfast on Ocean Drive, head over to Lincoln Road Mall for a shopping spree in the many stores. Once everyone has shopped until content, hit the actual beach! Don’t worry about your shopping bags-- those can securely be left on the charter bus rather than having to go back to the hotel. At the beach, your group can lay out and tan the old-fashioned way or rent a small cabana on the sand to enjoy the ocean view. If your group wants to get up close and personal with the ocean, rent a private sailboat or even jet skis for a half-day trip. Grab some sandwiches and fresh smoothies at La Sandwicherie to take aboard the boat for lunch on the water. Being out in the sun all day can be tiring. You can arrange to have your driver bus your group back to the hotel for a quick breather before the evening. Start the night at BASEMENT with dancing and your choice of ice skating or bowling in their indoor facilities. Then, for an even sweeter taste of Miami nightlife, hit the iconic Clevelander. The hotel throws pool parties all day and night, offering patrons indoor and outdoor bars with plenty of music. Whenever your group is ready to call it a night, feel free to hop back on your charter bus to safely be transported back to your hotel. With tasty all-day breakfast and brunch, it's safe to see why Front Porch Cafe has been voted one of the best breakfast places on the beach. Even better, if your group is craving breakfast for dinner, the Ocean Drive hotspot is open until 11:00 p.m. The Lincoln Road Mall is a premium outdoor shopping center stretching 10 blocks with stores ranging from affordable shops like H&M and Zara to luxury shops like Y-3 and All Saints. There are multiple companies available for watercraft rentals in the Miami area. If your group decides to rent a boat for a short ride, Miami Sailing is highly-rated among travelers and can accommodate relatively large groups. This counter-service restaurant is perfect for quick eats to take on the beach or on the road. A unique space in Miami Beach, BASEMENT is located in The Miami Beach EDITION. It combines the traditional fun of bowling and ice skating with a nightclub atmosphere. The Clevelander’s history in Miami Beach spans back to the 1930s as a central art deco hotel in the area. Now, over 70 years later, the hotel is still just as important to the beach, hosting a multitude of events adding to the area’s nightlife. Spend a relaxing morning at the Lapis Salon & Spa in the famous Fontainebleau on South Beach. Get pampered with your favorite ladies (and/or gentlemen) to start your day off right. After a morning of pampering, take your charter bus across the causeway to the Miami Design District. The area is a must-see for art, high fashion, and design lovers. While in the area, check out Wynwood as well for a completely different type of art and design experience. Before heading back across the causeway on your bus, be sure to hit Bayside for some daytime drinks, local music, and local shops. Grab an early dinner at CVI.CHE 105 and follow up with some sweets at the South Beach location of internationally-renowned Ladurée. Once everyone is full and ready to go, swing back to the hotel to get ready for LIV, a massive club located in Fontainebleau, known for its lively crowds, amazing DJs and an unparalleled good time. Nights at LIV are known to get wild, so your charter driver will be there to ensure everyone arrives back to your hotel safely. The Lapis Salon offers luxurious spa experiences from facials to massages. Group experiences with up to 6 guests are also available through Lapis. Perfect for window shopping or even an afternoon of splurging, Miami’s Design District is home to high-end clothing shops and various design galleries. This open-air shopping center is right on the water and home to dozens of local shops, restaurants, and daily live music. Pronounced “Ceviche 105”, this Peruvian restaurant has made a name for itself producing award-winning food. Originating in Paris, this luxury pastry shop is world-famous for their baked goods, especially their macarons. LIV has become a major hub for high-energy nightlife in Miami. It’s hard to think of clubbing in Miami without also thinking LIV. Falcon Charter Bus specializes in coordinating travel for groups of all sizes across different types of trips and events. If you need a bus for the actual wedding or for your last hurrah, we have you covered with reliable service. Give us a call today at 305-359-3962 to plan your Miami trip and to find the best bus for your group. Our experienced rental representatives are here 24/7!